Unique and Magical Wedding Productions. 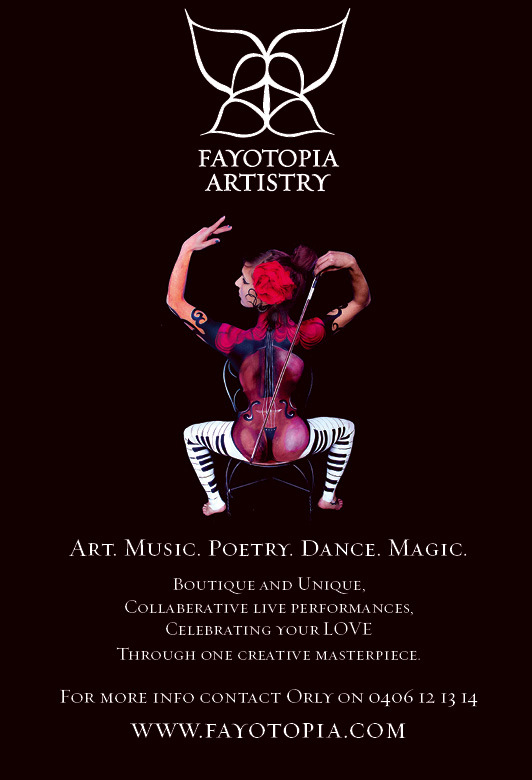 Fayotopia Artistry's Weddings Shows are custom designed, unique collaborative performances that showcase a range of quality performers such as musicians, artist, magicians and fire dancers. Collaborative art shows are set agains a silky backdrop of possibility, as the artist paints magic onto a canvas or a body, live music serenades the audience with harmonic vocal accompaniments, Guests may stop to watch or continue their mingling while the magical creation is formed under spotlights. All masterpieces are custom designed for the style of your event. Style of artist, music and poetry are combined in a unique way to express the nature of love in all its wildest possibilities. Be inspired by Fayotopia Artistry.